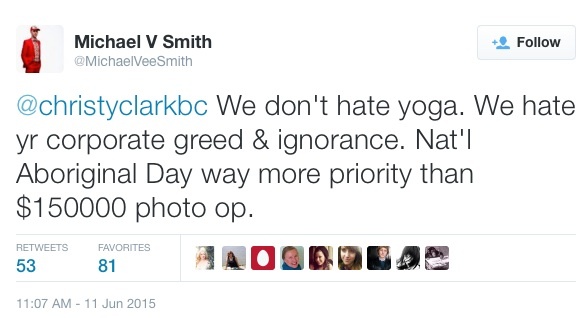 You’d think that International Day of Yoga would be a happy-feel-good thing all around, especially in the lotus-lover enclave that is Vancouver, British Columbia. It could have been, but then it became political, and got all muddled it up. And when it all first blew up, that was bad enough, but then the Premier thought it would be funny to mock her critics, but that blew back on her pretty badly too. 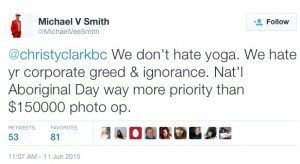 The story began when BC Premier Christy Clark took part in a news conference to announce that to celebrate Interna tional Yoga Day, June 21, 2015, the Burrard Street Bridge would be shut to hold a giant outdoor yoga event on the bridge, called Om The Bridge. At first it sounded like a fun event for a yoga-obsessed city, but then critics started delving in and it went sideways very fast. Critics were pissed off at all angles. First, the Burrard Bridge is a major thoroughfare into downtown Vancouver, and blocking it for several hours would really, really piss off drivers, businesses and commuters, even on a Sunday morning. Given how annoyed drivers have been over the years when the bridge was either under construction or losing lanes to create separated bike lanes, it seems obvious that closing this major crossing wasn’t going to be met well. And then there was the corporate aspect. This Om the Bridge event was being sponsored by two yoga companies and Altagas, and while the yoga companies weren’t a problem really, a gas company didn’t gain public favour in a province where many are opposed to gas and oil pipelines. Even beloved children’s singer Raffi voiced objections about the corporate-ification of yoga. A hashtag quickly gained traction suggesting people #shunthebridge. Another big objection was that despite the corporate sponsors, the event was going to cost taxpayers $15,000. 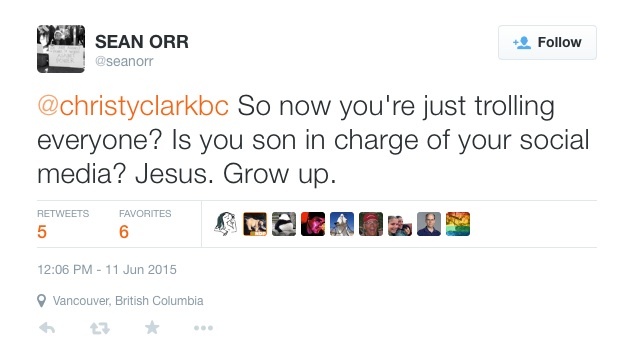 And oh yeah, it turned out June 21st was also National Aboriginal Day, so now they’ve also pissed off the First Nations, something you just don’t do in BC. First Nations artists and other leaders began rallying people on social media calling for a peaceful disruption of the mass yoga class with signs, singing and drumming. So with all the backlash, what does the Premier do? She goads her critics and makes it worse. “We would like to make clear that we were unaware that this photo had been taken or that the premier had even stopped by our location, which was closed at the time,” Jim Nicholson, a BC spokesman for Fung Loy Kok Taoist Tai Chi. After a few days of controversy, the yoga companies pulled out as sponsors, and Om the Bridge was cancelled before the week was out. While this whole thing only lasted a week, it was a week of bad press for the government from yoga, something that shouldn’t be a source of controversy. It went wrong, and then it was made worse when the Premier mocked her critics. I’d say this is a classic case of mistakes in media relations. Namaste.